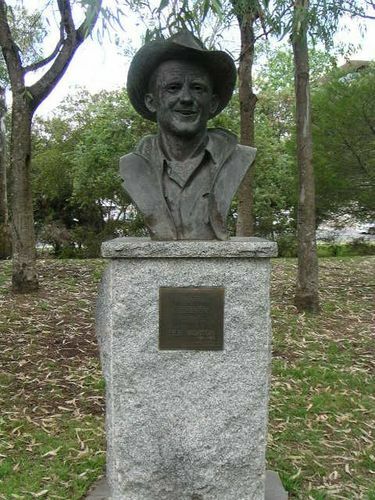 Portrait bus commemorates country music singer and Australia’s “Yodelling Boundary Rider”, Tex Morton who was born Robert Lane in Nelson, New Zealand, on August 30, 1916. Tex Morton developed a career and reputation as one of the most exciting and versatile performing artists on any stage in the world. As the first to record original country music in this nation, Tex is renowned as “the father of Australian country music”. By the late 1930s, Tex had become Australia’s most popular recording and radio artist. His appealing songs and stories backed by his own accompaniments on the guitar increasing his popularity tremendously. He did quite a bit of professional work on commercial radio and undertook an extensive tour throughout Australia for national broadcaster the ABC. Throughout all this success, Tex retained his love of the outback. In the early `40s, he formed Australia’s "greatest Rodeo and Wildwest Show" for a tour throughout the nation. "Moss would grow should I work for a boss!" For he has wealth beyond his wildest dreams. Thinks like a king, has the heart of a gypsy. And the whole of the wonderful country`s his home.